The 2018 Protect Wisconsin Waterways Sweep in Beaver Dam was a successful event. 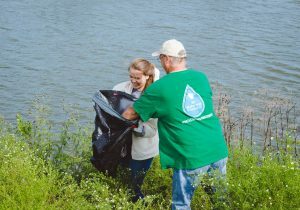 There were 14 volunteers at Patrick Parker Conley Park, where we cleaned up around the water and along the bike path next to the park. Clean up efforts filled 6 trash bags with the expected trash like candy wrappers and crushed cans, but also with the more exotic like a tire and a bike helmet. Also, we were able to make impressions upon community members using the dog park next to our clean up site, with Splash making an appearance there at the end of the event. At the event, volunteers were given event t-shirts and offered other promotional items, like pens and stickers. Refreshments were also offered to volunteers. 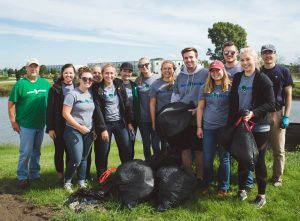 Overall, the 2018 Protect Wisconsin Waterways Sweep in Beaver Dam was a beneficial event.